One of our favourite gastro pubs in Brum, The Highfield in leafy Edgebaston, invited us along to test out their latest offering. 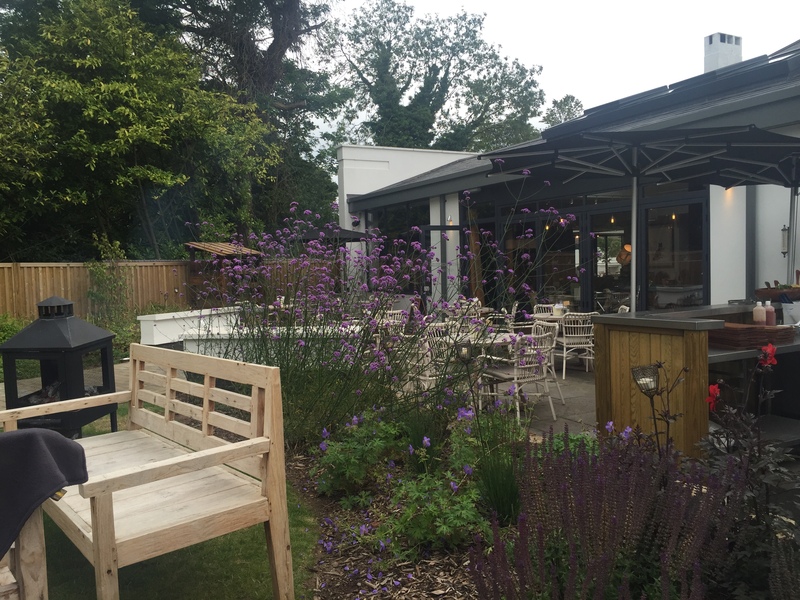 Making the most of their large rear garden, head chef Dean Jeffer has created an outdoor menu well-suited to the large wood fired BBQ they have had installed on the patio. On a Friday evening and all weekend from 12-8pm (unless it’s all been devoured sooner) they will be checking the mercury and when it hits the magical 20C out will come the matches and the Sipsmiths Summer Cup (personally I’ve become rather fond of this Pimm’s alternative, finding the flavours of their gin, infused with Earl Grey tea and lemon verbena, more appealing than the classic tipple). The menu should satisfy most smokey food hunters as you can choose from a selection of hanging skewers with options of 28 day dry-aged steak, monkfish with prawns or halloumi, glazed half chickens, pork chops or my personal favourite the four bone rack of dandy beef ribs with a lip licking BBQ & Bourbon sauce. They also serve all the classic sides you’d expect with special mention going to the corn on the cob which so many of my fellow diners seemed to be enjoying judging by the smiles and butter running down their chins. On the evening we attended the British weather tried it’s best to remind us we were in Brum rather than back in Normandy where we spent the last week by sporadically showering us all. This gave us a reasonto try out the other part of The Highfield’s summer investment as they have also installed a 12 seater party gazebo in the garden, complete with twinkling lights and rain proof walls. This is available to hire free of charge for private functions with various food options available. As the sun started to make a welcome appearance, so did the ultimate British summer dessert of strawberries and cream. 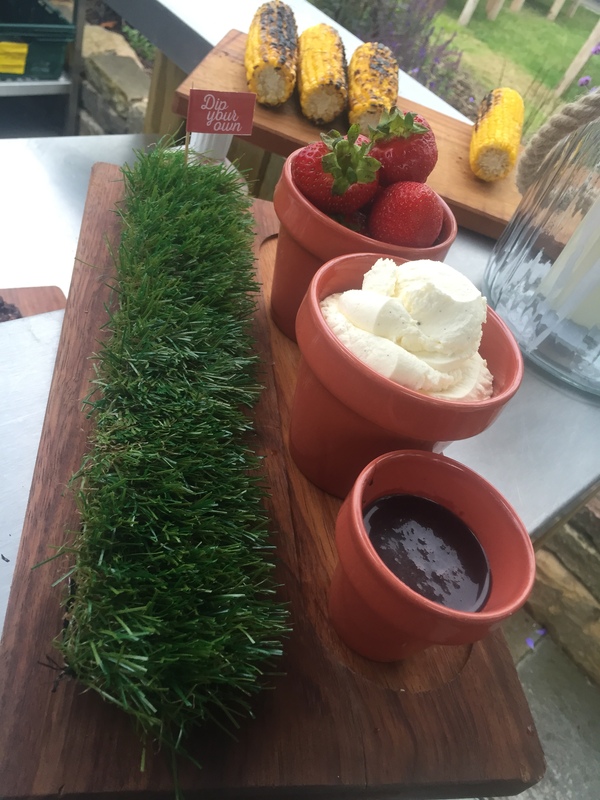 With a twist of course – a platter containing three terracotta plant pots, two of which contain the obligatory juicy strawberries and more tha n enough cream for all, with the third smaller pot being full of creamy chocolate dipping sauce. If it’s not quite hot enough for the BBQ or it’s a midweek visit, there are terraces and patios with canopies and heaters so you can maximise the alfresco opportunities. On this occasion we were guests of The Highfield and only paid for some of our drinks. This did not however have any input into our thoughts as we have dined, drank and held parties here ourselves on many occasions since they’ve opened.